I’ve been reflecting a lot recently on my trip to Central America, which was exactly one year ago. Every day, looking at the calendar and thinking about where I was, what I was doing, what I was experiencing. I visited 3 kids in Nicaragua, and it was difficult. Stinking hot, the driver got lost on all three days and my translator was frustrating, in that I sometimes had to prompt her to actually translate for me. The part that stood out to me was my visit to Antonio. This 8 year old kid was full of life. Chatty, talkative, animated. We hung out at the church for a while, drank coke, played with my Australian football. In contrast, I noticed his mother, who looked so young and was nursing a brand new baby, didn’t say a word. Even in our conversations she almost had to be prompted. I sensed much sadness and loneliness in her life. I took Antonio, his cousin and a few other relatives out to a chicken restaurant for lunch and they continued to talk, and talk, and sing, and talk. We had a ball. Then it was time for the home visits. Visiting the homes of my Compassion kids was always confronting. The realities of poverty were right there, there was no hiding from it. I was always received with hospitality and they were always welcoming, but because I have invested so much in these families, it hurt my guts to see the way they lived and the lack of opportunities they faced. Antonio’s home visit was probably the hardest I have done. It was The Turning Point, as I have entitled this blog. The house was nothing more than a brick box. Dirt floor, holes in the roof. One bedroom. No privacy for this woman with an 8 year old and a new baby. We sat around and chatted for a while. The conversation was driven by the Project workers, since I was lost for words, taking in everything around me, and still sensing Mama’s sadness and shyness. We got Antonio talking, showed him some pictures, gave him some gifts. When I do a home visit, I can normally ask to take photos of the house, even when I’m thinking “How do they live like this, day after day?” Today I couldn’t do it. It just didn’t feel right. I learned that Mama was 23, so she was just 15 when she had Antonio. Antonio’s father left just after he was born, and she now had a husband, who was as young, if not younger than she was. He scratches an income selling newspapers at the local market. The Turning Point came when we ventured out into the backyard, and I use that term loosely. It was a dump, with a cinder block out in the open for a toilet. At this point, everything that had been building up inside me as I learned about their reality came crashing down. I felt the full force of their despair, their hopelessness. I could not move. I had no words. After a couple of minutes I managed to speak: “Jesus. Jesus.” Over and over again, that was all I could say. The next few minutes were holy, sacred and powerful. I did the only thing I could think of. I held this beautiful young woman and I prayed for her. I lifted her up to God. God gave me the words, and He gave me the strength to say them. Mama was overcome. Her brokenness was evident, but as I prayed, I could feel her responding and crying out to God in her spirit. The Bible says God’s strength and power is made perfect in our weakness, and it was certainly true on this day. This was “The Turning Point” because God helped me to truely realise that without Him we have nothing. I guess I knew this in theory, but my wealth, prosperity, abundance, self-reliance and self-sufficiency prevented me from knowing it fully. People who are materially poor know what it is to depend on God and trust Him completely. They have to. This is a great example to me, and I know God wanted me to see all these things for this exact reason. I want to live a life that demonstrates complete trust, dependence and reliance on God, which is one of the reasons I am headed to serve Him in the Philippines. I don’t want material possessions or a life of comfort or ease to stand in the way of my relationship with God, so I am giving it up to pursue what I believe He has created me to do. Postscript: As heartbreaking as this day with Antonio and his family was, God has put two sparkles of blessing in their lives: Compassion and Antonio’s grandmother. 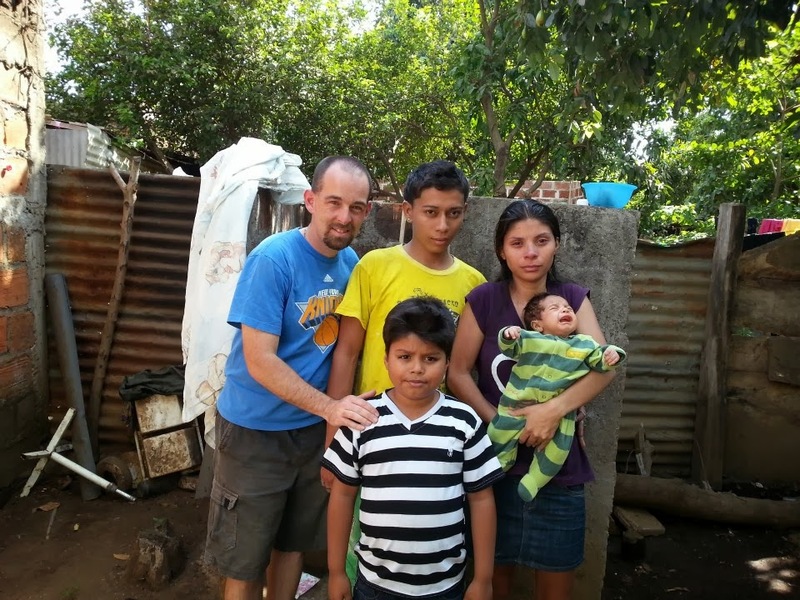 Without Compassion, Antonio wouldn’t have regular food, clean water, education or medical care. Even though Antonio’s father left, his grandmother stayed. I was inspired by the love Antonio’s grandmother has for him, even though technically she has no obligation to. Love of God in action. Antonio’s new sponsor is Kayla Groth. I know the relationship will be a blessing for both of them.